Date of arrest: On April 5, 2002. Position when arrested: When Tyrmyev was stripped of his military ranking of Major General and all benefits associated with it, he had been serving as Chief of the KNB for the Mary city for several weeks. He was reassigned and demoted to this less important post from serving as Head of the Border Service on March 5, 2002., ,  He was dismissed as Head of the Border Service for “serious shortcomings in his work and the use of his position for personal gain,” according to official sources. Charges: On April 5, 2002, he was convicted of ‘abuse of power’ according to articles 358 (part 3), 359 (part 2 and 33), 148 (part 2) 63 (part 3) of the Criminal Code of Turkmenistan. Ten days prior to the end of his initial sentence, he was charged with a crime against a prison guard. Sentence: His initial sentence was 10 years for abuse of power in high security. Other sources say 12 years. On March 6, 2012, he was sentenced to seven more years in jail at a closed door hearing in the prison court. He was sentenced in accordance with article 213 (part 1) of the new criminal code of Turkmenistan. According to this article, he should be imprisoned in a penal colony, but he is in the AT 2 prison in Akhalsk Velayat. Biography: Graduated from the Turkmen Polytechnic Institute (1971), The KGB Institute (1985). Tyrmyev began his career in 1971 at the Institute “TurkmenNIPIneft” where he held various positions including in management. From 1977, he was the first secretary of the Municipal Committee of the Nebitdag Komsomol. From 1981-1982 he was the Secretary of the Leninist Komsomol of Soviet Youth of the Republic of Turkmenistan. 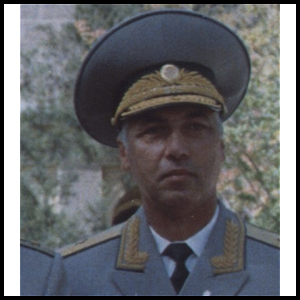 From 1985, he held various positions in the TSSR KGB (the Turkmenistan KNB). From 1993 to 1997 he was Head of the KNB of the Mary province. In January 1999 he was appointed First Deputy Chairman of the National Security Committee. On April 23, 1999, he was appointed Head of the State Border Service. On April 1, 2002, he was dismissed as Head of the Mary administration of the KNB due to “serious” shortcomings in his the work, stripped of his military rank of Major General, and all material and other benefits for military service, state awards, and dismissed from military service. He held the rank of Colonel from October 25, 1995 to April 1999 when he was promoted to Major General until his demotion on April 1, 2002. He was awarded the Order of the President of Turkmenistan “Garassyz Turkmenistana bolan beyik soygusi ucin” in January 2001 and medals “Edermenlik,” “For the Love of the Fatherland,” and “Gayrat” (December 1999). Information on arrest/treatment during imprisonment: Unknown. According to a statement by Boris Shikhmuradov dating to September 2002, Niyazov ordered that Tyrmyev be kept in strict isolation in “solitary confinement.” The last information about his imprisonment (in 2002) was that he was being kept in an internal prison in a KGB detention facility on Zhitnikov Street. In September 2002, he suffered from terrible headaches and extreme mental exhaustion. Last seen/heard about: Prior to sentencing, on May 7, 2002, Tyrmyev’s family was granted permission for a one time visit. Following this, they last saw him in the courtroom. Members of Tyrmyev’s family say they have not been allowed to see him or communicate with him since the summer of 2002. According to the articles by which he was sentenced, his family should have the right to see him at least 6 times a year. However, in the 12 years he has been imprisoned they have not been given permission to see him and have no idea about his condition. According to Boris Shikhmuradov, in September 2002, Tirkish Tyrmyev was alive, but his health was in critical condition. According to reliable information received from a source of Shikhmuradov’s in the Turkmenistan KNB, Niyazov gave his executioners a deadline: within three months from September 2002, General Tyrmyev should disappear. Relatives arrested/harassed/detained: His wife and daughter live in fear for themselves and their families. They are not allowed to leave the country. Radio Free Europe Radio Liberty. “Ex-Security Chief And Henchmen To Face Trial In Turkmenistan.” 9 May 2002. http://www.rferl.mobi/a/1342254.html. Accessed on 13 January 2014. Neitralniy Turkmenistan. “Saparmurat Niyazov razjaloval v ryadoviye treh generalov spetsslujbi.” 01.04.02. http://www.turkmenistan.ru/ru/node/13881. Accessed on 7 January 2014.
 International Relations and Security Network. “The Prospects for Internal Unrest in Turkmensitan.” April 2003. http://www.isn.ethz.ch/Digital-Library/Publications/Detail/?fecvnodeid=127081&groupot593=0c54e3b3-1e9c-be1e-2c24-a6a8c7060233&dom=1&fecvid=21&ots591=0c54e3b3-1e9c-be1e-2c24-a6a8c7060233&v21=127081&lng=en&id=92522. Accessed on 7 January 2014. Neitralniy Turkmenistan. “ Naznachen Noviy Nachalnik Pogranichniy Sluzbi Turkmenistana.” 05.05.02. http://www.turkmenistan.ru/ru/node/14546. Accessed on 10 January 2014. Neitralniy Turkmenistan. “Bivshie Rukovoditeli KNB Turkmenistana Obvinyautsya v Soversheniye 80 Predstupleniy.” 07.05.02, and an anonymous source. http://www.turkmenistan.ru/?page_id=3&lang_id=ru&elem_id=1259&type=event&sort=date_desc. Accessed on 15 January 2014. Radio Free Liberty Free Europe. “Family Appeals For Contact with Imprisoned Turkmen General” 19.04.2012. http://www.rferl.org/content/turkmenistan_general_prison_tyrmyev/24553675.html. Accessed on 10 January 2014. TsentrAsia.“ Tyrmyev Tirkish” http://www.centrasia.ru/person2.php?&st=1013880210. Accessed on 19 January 2014. TsentrAsia.“ Gospoda Ofitseri! B.. SHikhmuradov Obrashyaetsa k Turkmenskoy Armii s Prizivom k Vosstaniyu.” 11.09.2002. http://www.centrasia.ru/newsA.php?st=1031690460. Accessed on 9 January 2014.